Sri Maju has evolved into becoming one of the largest as well as prominent bus operators in Malaysia which was founded in 1978 by directors Dato Yeoh Kian Teik, Mr. Ng Yot Chew and Madam Loh Yin Mooi. Offering only one coach when it was first established, the Sri Maju Group has expanded to serve over 500 routes with daily departures from the entire west coast of Peninsular Malaysia and across Singapore. Acknowledging its very own motto of “Safety, Reliability & Quality”, Sri Maju always strives to serve quality services and is continually growing. The bus company takes pride in its efficient departures as well as arrivals because nothing is more frustrating than being delayed during a travel journey. To ensure a comfortable and a convenient bus journey, Sri Maju ensures to provide well-integrated buses and friendly staff members. The Sri Maju Group is aware of the ever-changing needs of a traveller where it is of the utmost importance to stay true to the company’s motto to keep safety, security and reliability as its priorities. Currently, there are more than 14 direct branches and 10 agents selling Sri Maju bus tickets throughout Malaysia, Singapore and Thailand. With offices located in Alor Star, Butterworth, Penang, Lumut, Ipoh (Amanjaya), Kuala Lumpur, Genting Highlands, Johor, Singapore and even Hatyai, Sri Maju offers 128 buses regularly routing in the west coast of Malaysia, Singapore as well as Thailand. Buses also depart from numerous locations including Kuala Lumpur, Genting Highlands, Johor, Kedah, Melaka, Negeri Sembilan, Penang, Perak and many more. The company has successfully gained notable positive reputations as one of the safest and most reliable bus operators in the country. Sri Maju takes pride in the quality of its coaches where each bus is equipped with an air-conditioning system along with comfortable seats for a pleasant bus ride. The operator also offers express bus services in both single and double-decked buses furnishing a satisfying choice for many travellers. For a more delightful experience, board Sri Maju’s Mega Luxurious buses especially provided for long-distance journeys. Each coach comes in a high decker with 21-seater and personal TV screens installed to offer a discrete entertainment system of the latest movies and music. 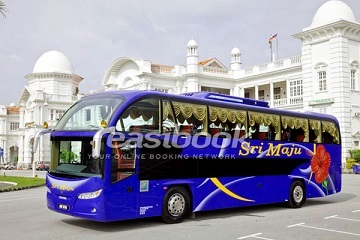 On top of its bus services, Sri Maju also offers tour packages and charter services for travel groups of more than 20 people within Malaysia, Singapore and Thailand. A selection of group packages has been specially tailored to choose from where travellers can get the chance to enjoy a fun-filled holiday with family and friends. As Sri Maju aims to offer comprehensive travel needs, Sri Maju Kangar has been established mainly to cater for travels in the state of Perlis. Sri Maju Kangar buses primarily depart from two locations known as Kuala Perlis Bus Terminal (by the Kuala Perlis Jetty) and Kangar Bus Terminal. Buses by Sri Maju Kangar will head to several destinations including KL Sentral, Terminal Bersepadu Sentral (TBS), Pudu Sentral and Putrajaya in Kuala Lumpur, Shah Alam, Kajang, Klang in Selangor, Butterworth in Penang, Ipoh and Lumut in Perak, Melaka, Johor as well as Singapore. 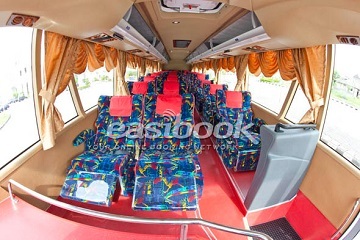 The best part about travelling with Sri Maju Group is the reasonable fares offered for its bus tickets. Tickets for a bus ride can now be purchased easily at affordable prices to get to a variety of splendid travel destinations within Malaysia and Singapore. Trips and holidays are made easier by simply hopping on to a Sri Maju bus to get to anywhere. 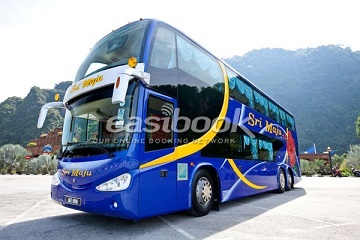 Grab the opportunity to purchase online bus tickets with Sri Maju now at Easybook. Head over to Easybook’s website or download the mobile app to book bus tickets conveniently anywhere at any time. Simply choose a preferred destination and leave the rest to the hassle-free online system. Book a ride with Sri Maju now on Easybook!